This kind of cap is mostly seen on the baseball field. Made of breathable poly twill to allow cooling air flow on sunny days, the shape of the cap will be retained for a long time as it is made of five structured panels. The low profile fit allows it to fit naturally. The shape of the pre-curved peak is durable and the cap comes with a short touch strap for perfect fitting and sizing. With your logo on the crown, these quality caps are ideal for baseball teams and sports clubs, but also for schools and organisations holding outdoor team activities. These caps will match perfectly with staff uniforms as they are classic baseball caps. Company logo or brand names can be printed or embroidered to these caps. Ordering these caps in bulk today you will receive the cap decorated by embroidery with up to 8000 stitch counts. 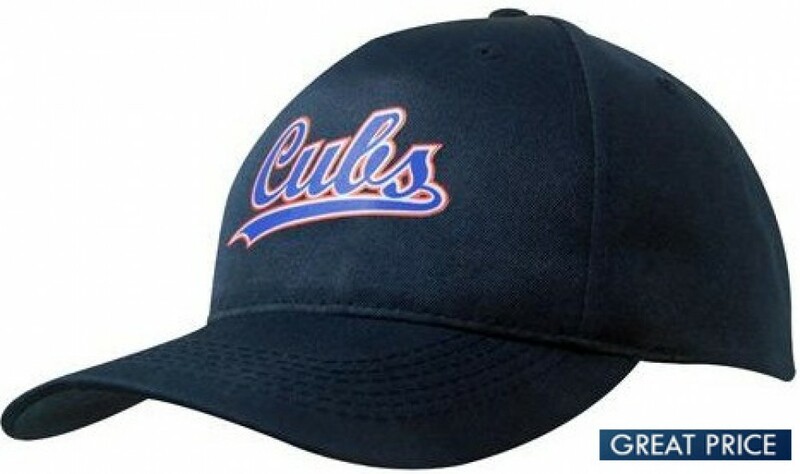 This cap is ideal for organizations, sports teams, school clubs, and mainly baseball clubs. To find out more about branding methods on caps, discuss it with our experienced sales staff. Artwork for the cap has to be supplied in eps, pdf or high resolution jpeg. The price excludes GST. It is stocked in Australia allowing for a fast one week production service. Our couriers deliver to the door, wherever it is in Australia. All states and territories -- NT, NSW, TAS, SA, WA, VIC, QLD, ACT. We deliver to cities, towns and regional areas. We are not currently able to deliver outside of Australia. A signature is required for delivery, so unfortunately we are not able to deliver to PO boxes.